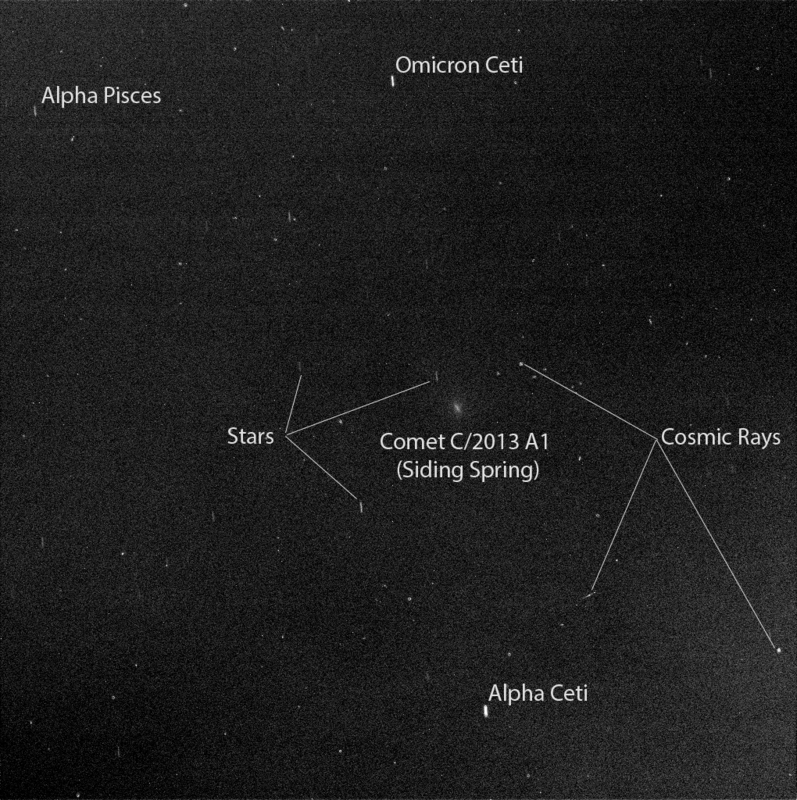 It may not look like much but it’s actually quite a lot: that bright smudge is Comet C/2013 A1 (Siding Spring) as it approached Mars to make its historic and much-anticipated close pass on Sunday, Oct. 19! The mountain-sized comet shot past Mars at an estimated distance of 88,000 miles traveling about 35 miles a second… that’s 20 times faster than a bullet fired from a 9mm handgun. While the comet didn’t put on a big show in our sky here on Earth (although some photographers did capture it quite nicely in telescopes) the rovers on Mars and spacecraft in Martian orbit were keeping their electronic eyes on it… and NASA’s Opportunity rover, now nearly 11 years on Mars, was the first to send back a confirmed image! We likely won’t see it around these parts again for another million years or so. Researchers used the panoramic camera (Pancam) on NASA’s Mars Exploration Rover Opportunity to capture this 10-second-exposure view. This image was taken about two-and-a-half hours before the closest approach. The sky was still relatively dark, before Martian dawn. At the time of closest approach the morning sky was too bright for observations of the comet. Some stars and cosmic ray hits were also captured in the long-duration exposure. For a labeled version of the original image click here. 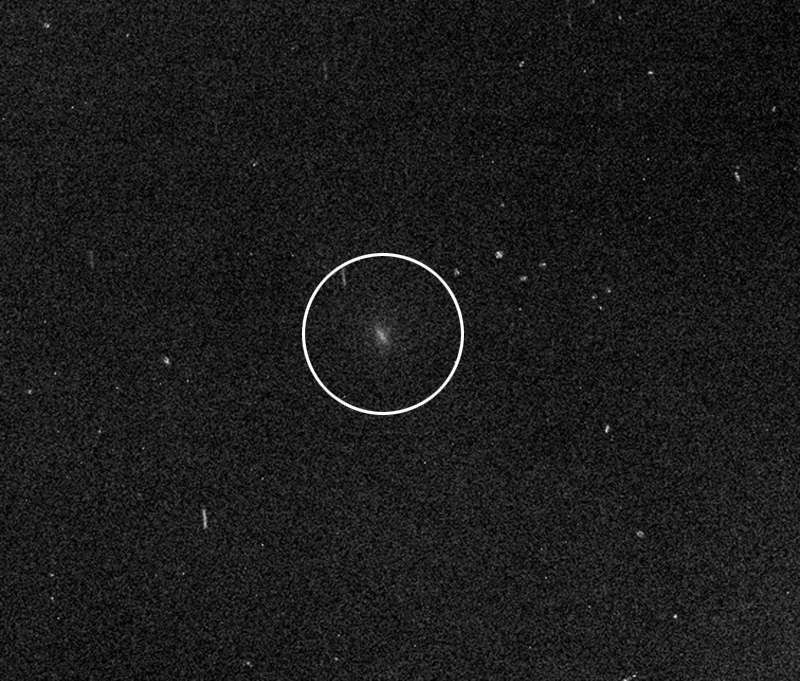 C/2013 A1 (Siding Spring) was discovered on January 3, 2013 by Robert H. McNaught at Siding Spring Observatory. At the time of discovery the comet was 7.2 AU from the Sun. *The closest a comet has come to Earth in recorded history was on July 1, 1770 when D/1770 L1 (Lexell) passed at about 6 lunar distances (0.0146 AU). Siding Spring passed Mars at just over 1/3 a lunar distance, or .0008 AU.